A110-1 EXTSV GLDR/SOARING OPNS WKENDS & HOLS; SR-SS; LAS R187/020; ALTS UP TO BUT NOT INCLG FL180. GLDRS RMN CLEAR OF THE TCA BUT OTHERWISE OPR WI THE ENTIRE SW QUAD OF THE TCA VEIL. A110-10 LGTD GOLF RANGE 1400 FT S OF RWYS 01L/19R AND 01R/19L. A110-13 (E98) PLUS 64 SHELTERS & 24 SHEDS. A110-2 ALL NON-STD RWY OPNS PPR FM DEPT OF AVN. A110-20 ACFT USING FULL LEN DEP ON RWY 08L USE MINIMAL PWR TIL PASSING THE PWR-UP POINT ON RWY. PWR-UP POINT IS 348 FT EAST OF BLAST PAD AND MKD WITH SIGN AND STD MARKINGS FOR BGNG OF RWY. A110-25 LRG NR OF BIRDS AND BATS INVOF OF ARPT BTWN SS AND SR.
A110-28 ACFT DEPG RWY 19R USE MINIMAL PWR UNTIL PASSING THE RWY THLD. RWY 19R THLD HAS STD RWY MARKINGS AND IS 780 FT S OF THE BLAST PAD. A110-3 TBJT DEPS NOT PMTD ON RWY 01R/19L OR RWY 01L/19R 2000-0800. XCPNS FOR WX OR OPNL NECESSITY. A110-30 ACFT OPER NEAR THE INT OF TWYS S, D, G AND THE N END OF TWY Z SHOULD BE ALERT AS THERE ARE CLOSELY ALIGNED TWY CNTRLN AND RADIUS TURNS. 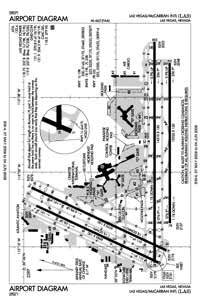 A110-31 ACFT THAT DEP FULL LENGTH OF RWYS 01L AND 08L MUST HOLD AT THE SAME HOLD LINE AS THERE IS NO ROOM TO HOLD BTN THE RWY ENDS AND SUCH ACFT SHOULD VERIFY THAT THEY ARE ON THE CORRECT RWY. A110-32 GA CUST AND IMG LCTD WEST SIDE OF AFLD BTWN FBO'S. A110-33 ACFT LRGR THAN B757 PPR FM DEPT OF AVN TO USE TWY H.
A110-34 NMRS HOP ON WEST SIDE OF ARPT. A110-36 ASDE-X IN USE. OPERATE TRANSPONDERS WITH ALTITUDE REPORTING MODE AND ADS-B (IF EQUIPPED) ENABLED ON ALL AIRPORT SURFACES. A110-37 GA CBP RSVNS ARE RQRD TO BE SMTD A MIN OF 12 HOURS IN ADVN (OTHER CONDS APPLY). RSVNS MUST BE MADE ONLINE AT WWW.MCCARRAN.COM/GACBP . 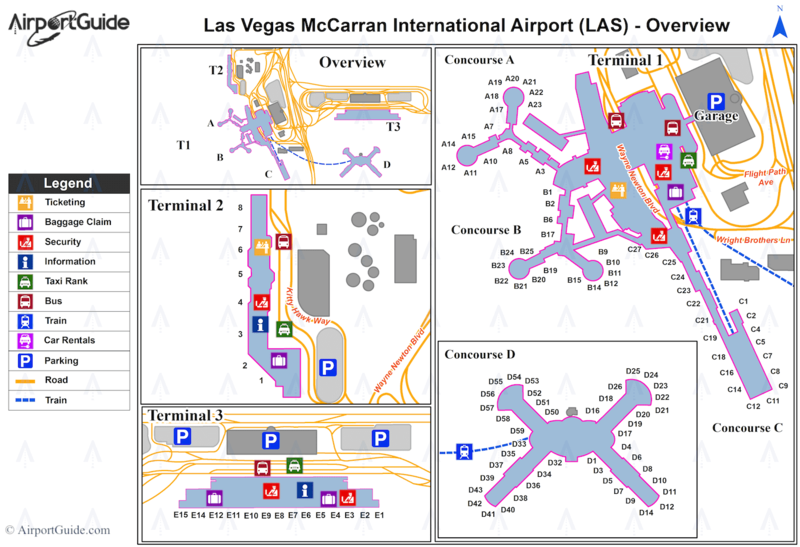 QNS CAN BE DCTD TO CBP559@MCCARRAN.COM. GA ACFT USING THE WEST SIDE CUST FAC MUST CTC RAMP CONTROL 124.4. A110-38 ACFT TAX WB ON TWY B NEAR TWY E USE CARE NOT TO ENTER THE RWY ON TWY Y, ACFT TAX WB ON TWY W NEAR TWY E USE CARE NOT TO ENTER THE RWY ON TWY U.
A110-4 ACFT MAY EXPERIENCE REFLECTION OF SUN FM GLASS HOTELS LCTD NW OF ARPT. REFLECTION MAY OCCUR AT VARIOUS ALTS, HDGS, & DSTCS FM ARPT. A110-40 ALL ACFT CTC RAMP CTL ON FREQ 124.4 FOR OPS AT A,B, AND C GATES, CTC RAMP CTL ON FREQ 127.9 FOR OPS AT D AND E GATES AND CARGO RAMP PRIOR TO ENTERING RAMP OR PUSHING BACK FROM GATE OR PRKG SPOT. A110-41 RWY STS LGTS ARE IN OPN. A110-6 GA PRKG VERY LTD. FOR PRKG AVAILABILITY CTC EITHER FBO (702) 736-1830 OR (702) 739-1100. A110-8 RWY 08L 589 FT CWY; RWY 26R 645 FT CWY. A57-01L APCH RATIO 34:1 TO DSPLCD THLD. A57-01R APCH RATIO 23:1 TO DSPLCD THLD. A57-19L APCH RATIO 50:1 TO DSPLCD THR. A57-19R APCH RATIO 20:1 TO DSPLCD THLD. E80 LANDING RIGHTS AIRPORT: CUSTOMS AVBL TO GENERAL AVIATION ACFT: MO, TU, WE, FR 0800-2300; TH 0800-1200 & 1700-2300; SA 1000-2300; SU 1000-1200 & 1700-2300.